‘Automation’ and ‘interconnectivity’ are the sort of buzz words commonly thrown around in conversations about Industry 4.0. But critical to becoming the sort of manufacturing business expected to flourish in the age of the smart factory will be software – the sort of digital technology that will unite production assets, create smoother processes and pave the way to more productive environments. This best-in-class, next-generation software package represents a totally new way of working with multi-sensor metrology machines, offering full 3D CAD-based programming to automatically and effortlessly generate measurement routines. It supplies real-time statistics about how a product is performing, giving manufacturers tighter control of their production processes through an ability to identify and address any issues as and when they occur. Such seamless interaction between operatives and their measurement systems leads to reduced scrap, minimal rework and increased throughput, as down time is slashed and parts are turned out right first time, every time. Working across a wide range of industries, OGP UK excels in helping customers to discover the benefits of ZONE3 and its world-leading multi-sensor metrology solutions. Once ZONE3 has breathed new life into their manufacturing operations, users never look back. Winbro Group, a world leader in the design and production of machines and technologies based on non-conventional processes, specialises in producing the miniature cooling holes and forms in components used in the most demanding part of aero and industrial gas turbines. These holes are critical in allowing internal airflow to prevent overheating during engine operation and, because effective cooling improves component efficiency, this leads to reduced fuel consumption and nitrogen oxide emissions on today’s generation of lightweight, low-noise jet engines. OGP multi-sensor metrology machines house superior optical, laser and tactile sensors, automatically selecting the right tools for any given task in one routine and eliminating the need for multiple traditional measuring systems. That’s why Winbro teamed up with OGP UK eight years ago and now uses three of its SmartScope systems – a CNC 300 and two Vantage 450s. Winbro Chief Technology Officer Andy Lawson said: “Ultimately it’s about the speed of inspection versus production. We’re able to take parts straight off the machine and then, while the second part is being machined or drilled, the first part will go into the inspection lab and in less than 10 minutes feedback is given straight to the operator to be able to control the process. In a similar cooling holes application, one aerospace reduced its measurement programming time from four hours to just 20 minutes using ZONE3, completely transforming its business model. Metrology tasks that were taking an hour on a co-ordinate measuring machine (CMM) are now taking 10 minutes, prompting the business to transfer all of its work from CMMs to OGP systems. Working quicker and to 100 per cent inspection accuracy has enabled the business to expand its order book, as quality assurance can be guaranteed. When leading pressworker Brandauer joined forces with automotive customer KSR International to deliver critical bi-metal lead frames for use in power steering control systems, it needed state-of-the-art non-contact measurement capabilities. 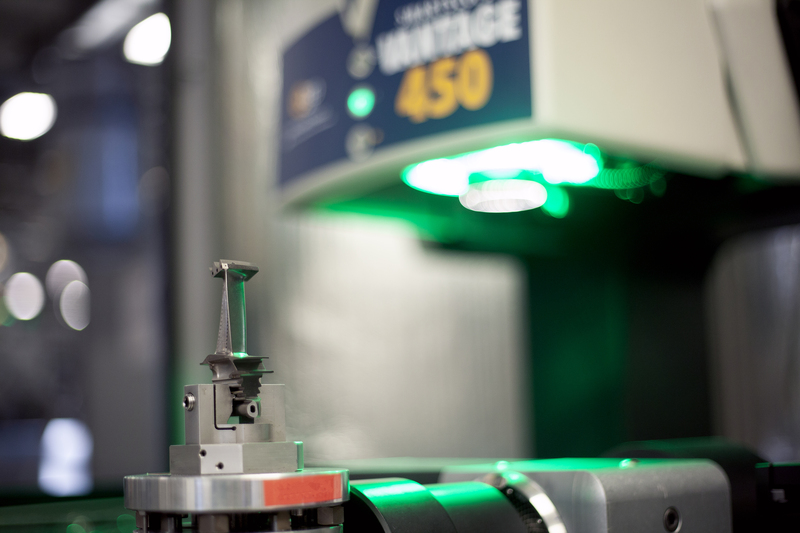 It chose to install two OGP Vantage 300s, which provided the ability to measure and report geometric dimension and tolerancing and guarantee repeatable precision in high volumes. ZONE3 fully automated the process to assess height, position, angles and surface finish all within one system, much faster and with additional capability. OGP works with a global medical technology company which manufactures millions of parts each and every week for its blood detection systems and other medical devices. The business has no less than 12 OGP multi-sensor metrology systems to assist its quality control procedures in the UK. When OGP’s engineers were challenged with a project to measure 128 components simultaneously, including all fixture positions, it delivered a fully automated solution using ZONE3. It was made possible by the software’s synchronous, full-field image processing and high-speed cameras, which allow entire scenes to be measured instantly. Clearly, the speed and productivity benefits have been significant. What could ZONE3 metrology software do for you? Ask us for a quote today.